For the Psoas Muscle Release, or Psoas Resolution, please let me refer you off my site to Core Awareness with Liz Koch. I’m really excited about her work and she can tell you the best. The psoas (so-as) is a large pair of muscles from the spine between the pelvis and the ribs that wrap like cradling wings around to the front of the pelvis and drop down to attach at the lower end to the top of the thigh bone. They help us walk upright, support our abdominal organs. The tone of the large psoas pair can have an effect on the descent of the baby and even fetal position. What: Origin and Definition Two great psoas muscles comes down from the spine from beneath the level of the ribs and respiratory diaphragm to the lower lumbar spine and each one angles forward over the pelvis, draping over the leg socket and attaching to the lesser trochanter. And constipation, fetal engagement and descent. 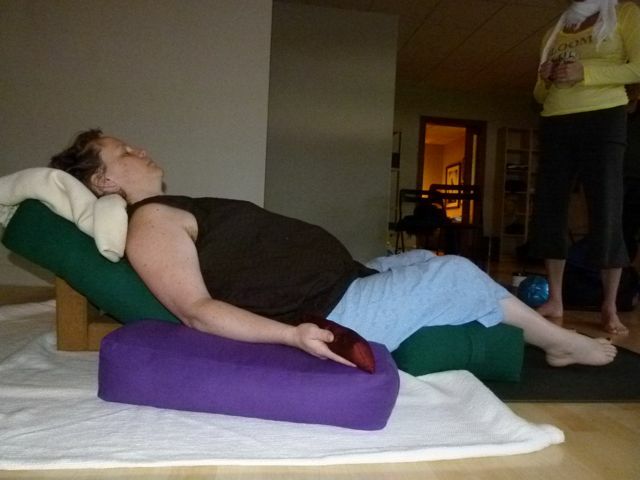 We “release” tension stored in the psoas for optimal body function. Liz Koch calls it hydrating the psoas or “unraveling” it. 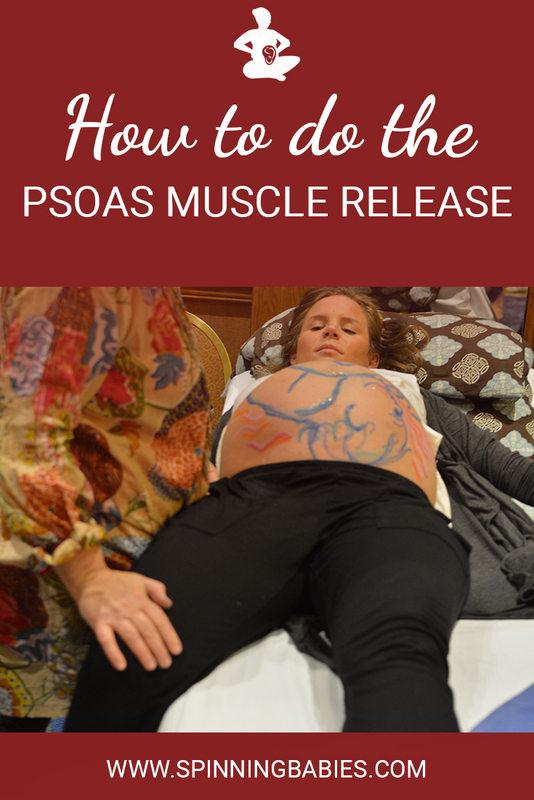 There are ways to restore the psoas while pregnant that may not involve so much inversion, but I put this here to really open up our awareness of our bodies in a very new way for most of us. You’ll learn a lot from listening to Liz narrate this adventure. She talks about asymmetry on a different level than I use the word. I don’t find a conflict with the difference; I find a higher examination of the body. Liz Koch can take you there! At any time. In pregnancy and during labor. Before or after pregnancy, for all. There are several activities, as well as generally good posture and breath that help release the psoas. Sitting with knees lower than the hips is a really good way to allow the psoas to lengthen. Here’s a picture of Liz Koch giving Gail a lesson in sitting on a bolster. Check out this link to Collette Crawford interviewing Liz Koch and includes a shout-out to Spinning Babies. Here is a link to Liz Koch’s favorite Yoga activities for releasing the psoas. I can’t think of any time not to! Before doing these exercises, find a moment with peace to set up a little space and time to do them without a busy mind distracting you from your perceptions. 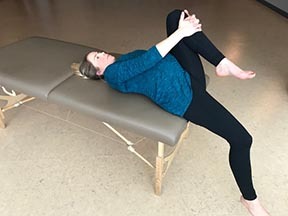 There are several ways of doing a psoas release. This is a simple one that is easy to learn. Why? A tight psoas muscle pair keeps baby high. A long labor can relax the psoas, as may an epidural, but why not improve your body’s balance by relaxing your psoas in pregnancy? A longer, more supple psoas is one of several factors helping baby engage at 38 weeks gestation. How? Lie on your back with your feet on a chair so that your calves are at a 90-degree angle to your thighs. Thighs are straight up and down and calves are horizontal. After five minutes, roll to your side and get up slowly. One day you will notice that your lower back relaxes enough so that the space between your lower back and the floor disappears. Don’t force your lower back to touch the floor, wait till it happens on its own. Then repeat this technique occasionally. Before that, do it daily as much as you can, but for five minutes at a time. Do this when….You have constipation. A lack of engagement of baby’s head after 38 weeks. You’ve had a previous long labor. this is your first birth. You have a history of sexual or emotional abuse. You do desk work or lots of sitting including driving. It’s hard to stand up tall. Don’t do this if… Any time on your back is not possible. Roll over to your side if you feel unwell while doing this. Remember, you spend 5 minutes on your back for a prenatal exam. This 5 minutes will be ok! Note: Can’t lay down? Your lunges, when done properly, will help your psoas, too. As will daily, brisk walking, breathing deeply and letting your belly relax. Kneeling lunges, standing forward lunges, and sitting with your knees lower than your hips help lengthen your psoas. Any activities that arch your body backwards from your leg socket, so to speak, will help. Drink water to hydrate your psoas or the stretches won’t find a muscle with mobility. Next: After doing these exercises you will feel more relaxed and centered. Keep the breath flowing and repeat the exercises as needed. 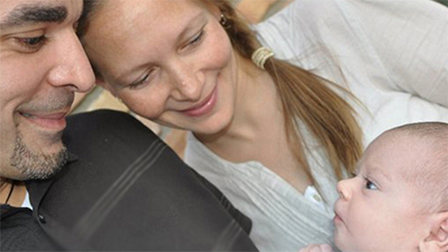 A resolved psoas is life changing for all as well as advantageous for the pregnant and birthing woman.